Car heaters… Monopoly… Disposable diapers… The dishwasher… Kevlar… Maritime flares… Anti-reflective glass… Wifi… Syringes… Submarine periscopes… Diagnostic tests… Lifeboats… Windshield wipers… Ebooks… What do each of these revolutionary inventions have in common? They were all pioneered by women! 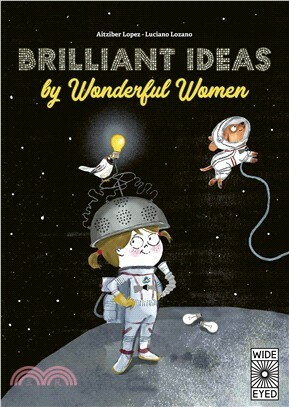 Each brilliant idea is presented with biographical information about the brilliant woman who came up with it, including what inspired them. Learn how Martha Coston disguised herself as a man to contact pyrotechnicians and convince them to manufacture her idea for maritime flares, how a New York tram ride on a wet winter’s day led Mary Anderson to invent the windshield wiper and why Letitia Mumford Geer’s one-hand operated syringe was a medical breakthrough, among other fascinating facts. Full-page illustrations show the inspiration for and use of these incredible inventions in humorous detail.